Situated in Astorga, this spa hotel is steps from Museo de los Caminos, Palacio Episcopal, and Museo del Chocolate. Astorga Cathedral and Museo de la Catedral are also within 5 minutes. Astorga Station is 9 minutes by foot. 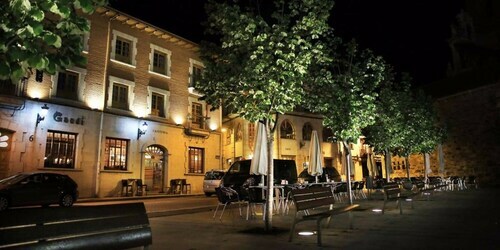 Situated in Astorga, this hotel is steps from Astorga Cathedral, Museo de la Catedral, and Museo de los Caminos. 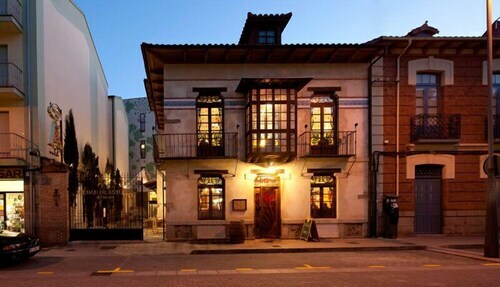 Palacio Episcopal and Museo del Chocolate are also within 5 minutes. Astorga Station is 10 minutes by foot. 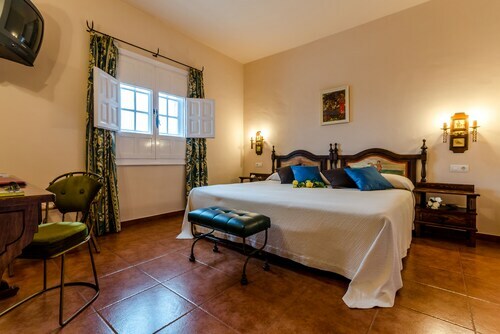 Situated in La Baneza, this hostal is 2.3 mi (3.7 km) from Museo de las Alhajas en la Via de la Plata and 6.3 mi (10.1 km) from Plaza de la Iglesia. Puente del Passo Honroso and City Hall are also within 20 mi (32 km). Situated in the mountains, this hotel is within 6 mi (10 km) of Palacio Episcopal, Museo de los Caminos, and Museo de la Catedral. Astorga Cathedral and Museo del Chocolate are also within 6 mi (10 km). How Much is a Hotel Room in Santiago Millas? Hotels in Santiago Millas start at $37 per night. Prices and availability subject to change. Additional terms may apply. Make sure you book early, as there aren't many rooms near Santiago Millas's heart. The Rusticae Hostería Camino, Castilla - Leon, which is the nearest hotel, lies 7 miles (11 kilometers) from the town center of Santiago Millas. 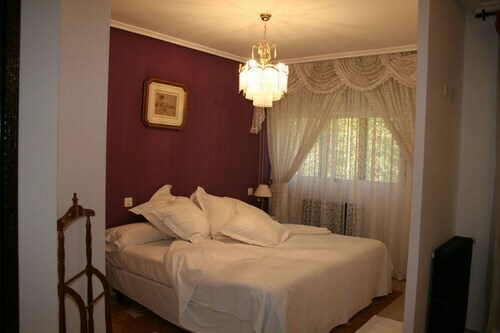 Another convenient Travelocity-listed place to stay is the La Casa del Filandón, which is found in Castilla - Leon, about 8 miles (12 kilometers) from the center of Santiago Millas. Located 6 miles (9 kilometers) away from downtown Santiago Millas is the Hotel Temple Pradorrey. The El Paso Honroso is located 12 miles (20 kilometers) away. After you have spent time in Santiago Millas, take a trip and investigate some other attractions in Castilla - Leon. Photographers will love Castilla - Leon's rivers. While you're at it, discover many of the area's old towns, historic palaces and churches. In this section of Spain adventurous visitors might also try their hand at rock climbing and mountain climbing. The nearest places to spend the night in Leon are Azadinos and Trobajo del Camino. Azadinos is 30 miles (48 kilometers) to the northeast of Santiago Millas, while Trobajo del Camino is 30 miles (46 kilometers) to the northeast. Azadinos lodgings include the Parador de León and TRYP León Hotel. The Nh Collection León Plaza Mayor and AC Hotel León San Antonio by Marriott are amongst the places to base yourself in Trobajo del Camino. If you think of sport as your life and enjoy attending matches you should definitely get to Leon Arena, which is 30 miles (49 kilometers) to the northeast of Santiago Millas. Find a Travelocity-listed hotel close to the action at the QH Centro León or the Hotel Conde Luna. When you are flying into Santiago Millas, Leon Airport is the most practical option. It is 25 miles (43 kilometers) from downtown. Hotel Alfageme is close to the airport.